After squash bugs killed every last zucchini and summer squash plant in my garden (sob) I have been on a quest to figure out how to derail them. For next year. Because it sure hurts this year to not have the huge baskets of squash and zucchini to cook every day. I came across this recipe for an all natural garden spray that you can make with ingredients you have at home in my Vegetable Gardener's Companion book. It was easy to make and this stuff smells AWFUL. If I was a bug, I wouldn't come near it! You mix 3 cups of hot water, 1 tbsp cayenne, and 7 cloves of garlic. Let it steep for 4 days. Strain it and toss it in a sprayer. The only issue I've had from it is finding a sprayer that doesn't get clogged from the ground cayenne. I think next time I need to strain by a cheese cloth instead of just by wire strainer. In other garden news, I planted a few things to see if I can get a fall harvest. Last year the only thing I planted midsummer was beets. This year I found seed packets on sale for 20 cents each, so I picked 4 items to try. Maybe I'll get lucky and redeem my garden before the season is over. For now, the only veggies we're enjoying are cucumbers and beets. It's Rural Thursday, hosted by myself and Nancy from A Rural Journal! Time to share your stories of the rural life (even if you aren't living it yourself) with other bloggers. Just grab the code below the button and paste it into your blog post. Then come back to link up. Be sure you visit and comment on the blogs of at least 5 other participants - it's the visiting and commenting that make a blog hop like this so fun and successful! That seems to be an easy and cheep solution to get rid of the bugs. Have a great day! The bugs have been bad this year with the hot, dry weather and I've had to buy several bottles of bug killer. It would be nice to make my own and this looks easy enough. Gardens are suffering here this year as we have had immense amount of rain and everything has been eaten by slugs and snails ugh! I like the sound of your spray hope it works. I am glad to know that recipe!I bet it repels all bugs! I'll have to try that. We don't spray so a lot of our garden gets eaten. lisa thanks for sharing this great recipe! I am so sorry those bugs got your veggies... that is very aggravating, but bet next year, this won't happen! What a great and free way to get rid of bugs. That is awesome! I can practically smell your spray from here, but if it works it's worth it! I understand that some diluted soap or detergent makes for a good bug spray. Sorry you've lost so much of your garden to the invaders! I bet cheesecloth will do the trick! I like the idea of an environmentally and health-friendly bug spray. Thank you for sharing. I hope to have a garden next year. Sorry yours hasn't done so well this year. This hot and dry weather has not been kind to it! Good bug killing recipe to have on hand. The natural way is always the best way. good luck w/ the bugs! Have you ever done a Fall planting of peas? I'll have to give that recipe a try. I'll share it with my Dad who has issues with Asian Beetles right now. I wonder if it works to get rid of them? Absolutely. Yes, Llos insects are the worst enemies of the garden. oohhhh those darn bugs eat better then we do!! good luck, i hope the spray works!!! I'm so glad you've shared this. I had those horrible losses last year too for the first time. I only had a couple of plants this year, but one was destroyed. I will certainly be trying this next year also! Sounds wonderful. Hope it works for you. How sad to lose your crop to bugs...hopefully your seeds will take root and you will be rewarded in the fall! Bummer! But if I recall, you guys like beets. Which, in my opinion, is not normal, but they are good for you. The bugs have been especially bad this year! i've been dealing with cucumber beetles and squash vine borers...they are both super destructive. i've had quite a few squash bugs too, but they've been easier to deal with (picking them off by hand). Depending on your first frost date, you may still have time to plant more zucchini. i plant it every three weeks during the summer, so as plants are dying back i have new ones ready to harvest. Good luck with your fall garden! Oh I like this idea...I hate bug spray but it is such a necessity here in Florida. Thanks. Also, thank you for stopping by and saying hello. I appreciate it. We have trouble with critters eating our flowers/bulbs, etc.... We at one time have used things like cayenne pepper, moth balls, and stinky things like that ---as we read about them on the internet... Don't know if either of them will help your problem or not---but keep on reading... You'll get all kinds of good suggestions. This sounds like a safe solution to try with children around. Sounds easy enough. I'll be curious to hear how it works! Prob works on deer too? Sounds like a great tip. I'll have to give this a try. thanks! Thanks for coming by my blog. That is really too bad about your squash and zuccini. I hope that your bug spray does the trick to get rid of them before they get your zukes again. Not sure I would let my cat in the veggies though, cuz that stuff can really sting their eyes if it gets in. Love your farm. I also really like the dress in your next post. It looks so comfortable and cute. Sorry to hear about your zuccini & squash. Hope that bug spray keeps those buggers off next year. 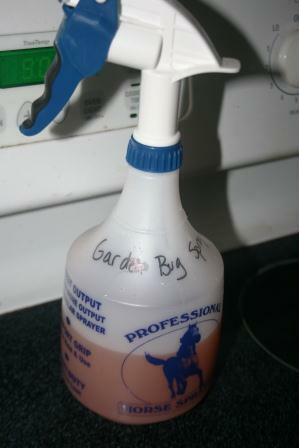 I'm going to mix up a batch of this and see if it will solve the ant problem we have been having on our patio. Everything else we have hear about and tried has failed.